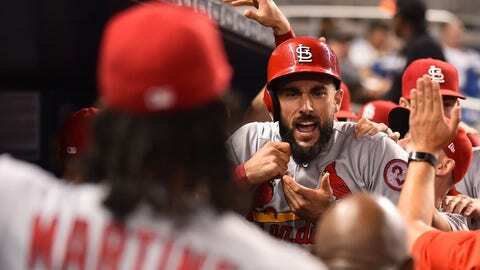 Matt Carpenter's eighth-inning homer, his 30th of the season, lifted the Cardinals to a 3-2 victory over the Marlins on Tuesday. MIAMI — Even Matt Carpenter has been surprised by the run he has been on. Carpenter sent a shot off Elieser Hernandez (2-6) into the Cardinals bullpen in right field, homering for the fourth time in five games and increasing his career high for home runs. Several St. Louis relievers celebrated with their arms in the air. Mikolas wanted to make it a point to work quick in the two-hour, 34-minute contest because of his one-year-old daughter. “It was my daughter’s first baseball game, so I knew her bedtime is early and I wanted to made sure she caught as much of the game as possible before she had to go to bed,” Mikolas said. Cardinals: RHP John Gant (3-4, 4.12 ERA) is slated to start Wednesday’s series finale and will be looking to bounce back after allowing six runs over four innings at Pittsburgh in his last start.